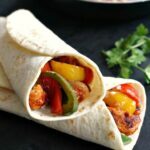 Healthy Chicken Fajitas, a lovely light & super quick midweek dinner that is ready in under 15 minutes. Forget about diet books or expensive meals, eating the right food to keep yourself happy has never been easier. Mexican food is so popular all over the world, and this dish must be one of the favourite. I cook chicken breast very often, it’s inexpensive, light, has a great taste and can be ready very quickly, thus cutting the time spent in the kitchen. Not that l dislike it, but time is ever so precious and, if l can do lots of things in one day, why not. Although l prefer the red peppers out of all the other varieties because of their sweet taste, the green and yellow ones added to the red peppers make this dish pretty and colourful. What gives the distinctive Mexican flavour is the smoky spicy sauce, which is enhanced by the sweetness of the caramelised onions. Such a treat! I should make this dish more often.You do not have to add any sour cream if you do not like it, but l find that its fresh taste balances very well the flavours. And tortilla wrap can be either microwaved for a few seconds to warm it up, or grilled. I prefer grilling as the wraps get a nice crunchy texture that makes the fajitas even more delicious than they are. Such a treat! 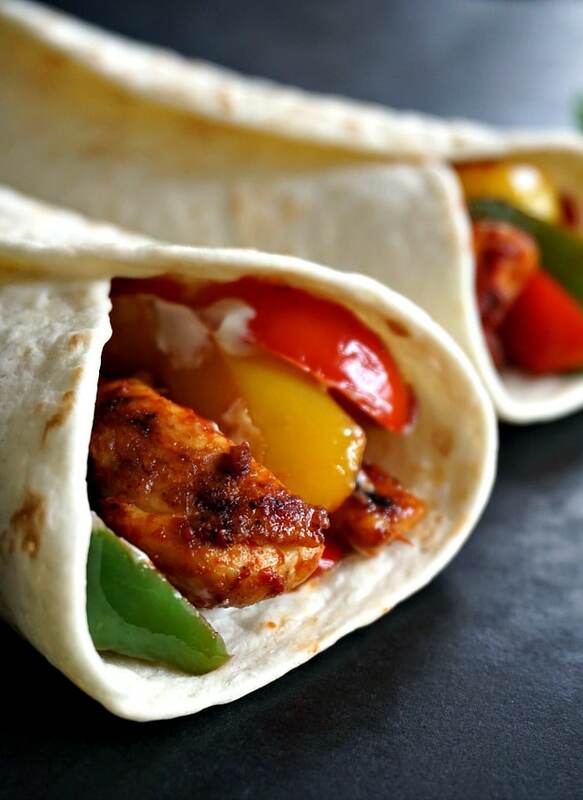 How do you make healthy Mexican chicken fajitas? If you are keen on cutting down the amount of carbs, you can enjoy this fajitas without the tortilla wraps. 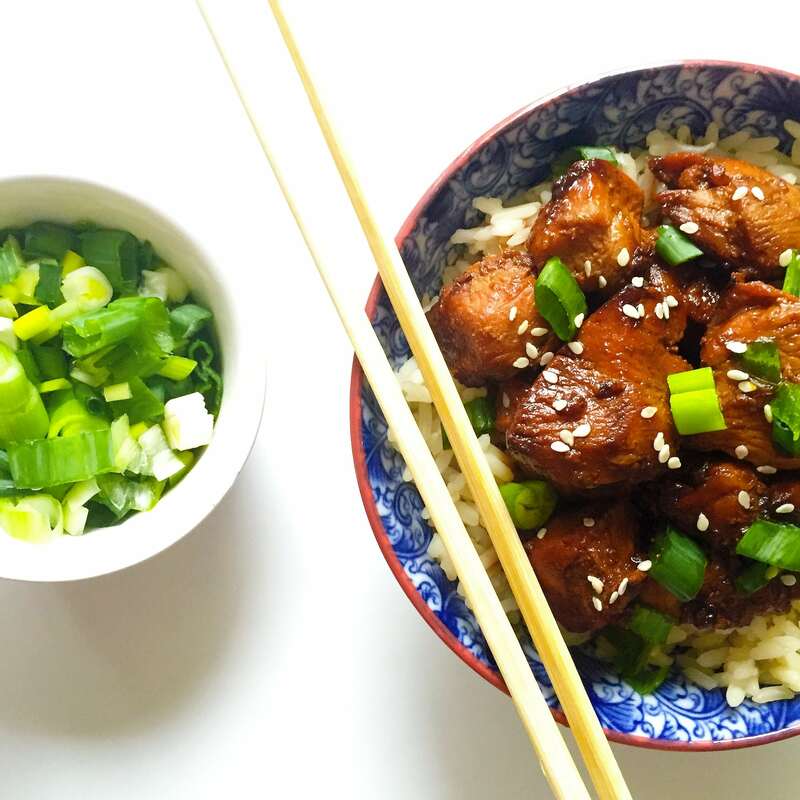 You got chicken and veggies, and that is a filling enough meal that is nutritious and delicious. Although it’s just not the same without the wraps. Maybe try the wholemeal tortilla wraps instead of the plain flour ones, and that should up the fiber intake and make it a healthier, better option. Swap chicken for beef or pork if you like, it will still be a winner, it might just add extra time to your cooking, as chicken usually cooks a lot faster. How much spice goes into the fajitas is entirely up to you, even some nice chilli peppers can be thrown into the pan. 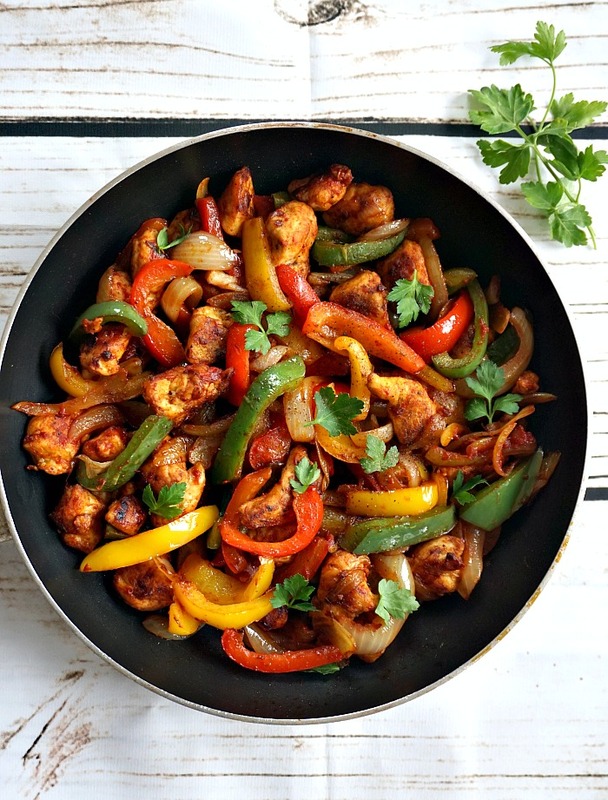 If you’ve tried my HEALTHY CHICKEN FAJITAS RECIPE or any other recipe on the blog then don’t forget to rate the recipe and let me know how you got on in the comments below, I love hearing from you! You can also FOLLOW ME on FACEBOOK, and PINTEREST to see more delicious food and what I’m getting up to. 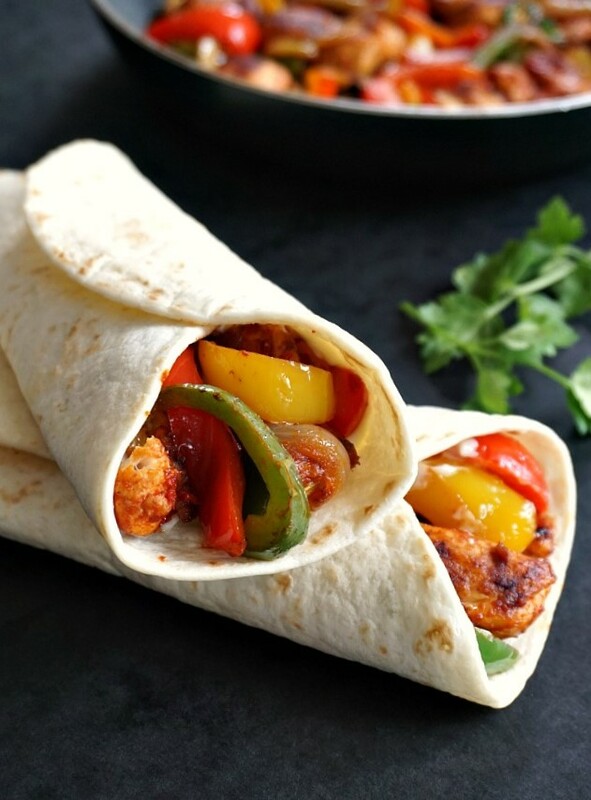 Healthy chicken fajitas, a quick and easy midweek dinner that is light, healthy and delicious. Ready in well under 15 minutes. To cook the chicken, heat up a grill pan, cut the chicken breasts into cubes and place them in a bag. Add one tablespoon of oil, paprika, bbq sauce, pepper and salt, seal the bag and shake well. Grill on both sides until cooked through, approximately 3 minutes on each side. Cut the onion and peppers into strips, add the remaining oil to a pan, and fry the onion with a pinch of salt until tender. Add the peppers and stir, leaving them to cook for about 5 minutes until slightly tender. Season well with salt and pepper, add the tomato paste and chicken, then stir. Garnish with parsley and remove from the heat. Warm up the tortilla wrap, spread the sour cream or mayonnaise over, then add chicken mixture to it. Wrap well, and serve immediately. Thank you, Silvia! 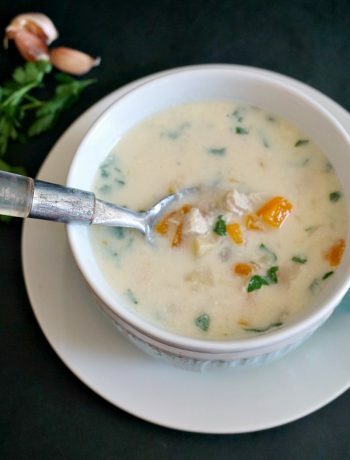 It’s an easy recipe, l am sure you’ll love it! ?